Venezuela, a country on the northern coast of South America, with tropical beaches and cities with an enthralling colonial architecture. The history of the hispanic nation begins with the landing of Spanish Explorer’s on its shores in 1499, albeit one of the most imperative events in its history, was the discovery of oil under the sweltering Venezuela jungles. This occurrence defined the country for years to come, during the 1930s, its GDP rose to be the highest in all of latin America. At the dawn of the twentieth-first century, it was announced that Venezuela’s oil reserves exceeded that of Saudi Arabia, and hence became the biggest in the world. With such soaring amounts of oil, one would think that Venezuela would continue the previously mentioned trend of prosperity, albeit this is not the case. Almost every week, news websites are proliferated with stultifying news. In 2019, almost 4 million people fled the country, the Venezuelan currency is worth less than that of the video game World of Warcraft due to inflation, and any democratic processes remaining in effect are a flagrant display of the lack of the democracy that they are supposed to espouse. Taking all these factors into contemplation, the question has to be inevitably asked, how did the country with the most ample supply of oil, descend into a state of absolute economic and social deprivation? To find an answer to this overly ambiguous question, we must look into the history of Venezuela. Over 40 years ago, Venezuela was the opposite of what it is today. This was the time when South American nations looked at Venezuela with envy, as Venezuela exalted itself on to the position of the strongest economy in Latin America, thanks to the flood of petrol-dollars coming from the United States. The golden age for Venezuela’s economy began in 1973, when many Arab countries embargoed the United States as condemnation of their support of the Israelis in the Yom Kippur war. This was when the Venezuelan oil took precedence over the Arab one in the western countries looking for an alternative source of petroleum. Albeit, this golden age was soon to come to an end. In the wake of the oil embargo in 1973, a new president, Carlos Andres Perez was elected, and, in spite of the popular notion that Venezuela’s downfall began with the reign of the present socialist establishment, this is where some of the symptoms of political and economic instability began to appear. President Perez pursued an economically isolationist agenda, which preached that, thanks to the wealth that Venezuela has gathered during the crisis, it can dislodge itself from the influence of foreign markets and companies. This beginning of this process was began with the nationalization of the Venezuelan oil industry, this meant that most of the oil revenue from now on landed in government’s pockets. This was when the prosperity of Venezuela reached its apex, Venezuelan tourists became known as the ‘give me two’ people, as they would enter a store and buy everything that came to their liking without even asking for the price, it also became common for middle class Venezuelans to fly to Miami for the weekend. Back then, the poverty that is now affecting 9/10 Venezuelans, didn’t even surpass 20%. The problem arose when the government of President Perez began using this wealth to its own advantage. Due to the fact that most of the oil revenue now belonged to the government, they had not only nationalized the oil industry, but most of the economy. The result of this was the fact that for most Venezuelan companies, it became more profitable to gain favor with the state, instead of increasing the quality or the demand for their products. This led to increased corruption, as companies attempted to influence the workings of the federal government to their own advantage to gain leverage over their opponents. All of this repulsed foreign investors, as they saw no point in competing with companies who had the unwavering support of the government. The government of President Perez also proved itself to be corrupt, as it was divulged that he had used the revenue from the oil to fund his reelection campaign. 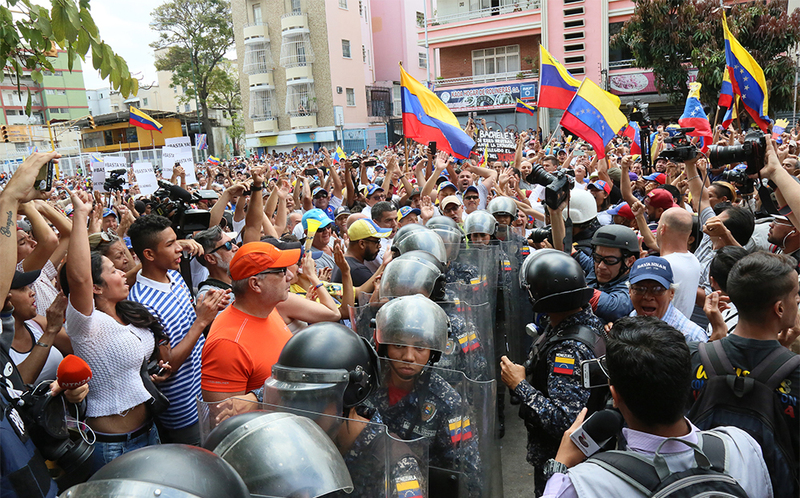 This, in addition to the previously mentioned economic problems, led to a failed coup attempt in 1992 and a series of popular protests dubbed the Caracazo, where over 300 people were killed by security forces. Now with the legal evidence of abuse of power, and popular support, the president was impeached by the Venezuelan Supreme Court. All of this left Venezuela with a horrendously high public debt, and not a penny to spend. This chaos was when the currently ruling United Socialist Party of Venezuela crawled out of the political periphery. Their leader, Hugo Chavez, gained a public profile during the 1992 coup attempt, as he was the military officer who was primarily responsible for its instigation. Chavez, a self-proclaimed marxist, was criticizing the policies of the previous government as being weak, and also planned to punish Venezuelan companies for their ruthlessly pragmatic stance in the wake of the fall of Venezuelan economy. This new ideology, was named Bolivarianism, named after Simon Bolivar, the leader of South American wars of independence, played right into the minds of Venezuelan lower class, as it had marched onto the streets during Caracazo due to the policies of the previous government criticized by Chavez, as well as Chavez’s coup attempt, which inspired popular opposition against the Perez government. Because of this, Hugo chavez won the election of 1999 with a majority of the votes. Chavez promised to fix a broken political and economic system, and bring Venezuela back to its former glory, albeit things were about to get much worse. One of the first acts of Chavez during his presidency, was a deliberate subversion of the balance of powers in Venezuela. What he called during his campaign a broken political system, was the Venezuelan democracy itself, and he made it his task to destroy it by, often illegally, appointing his associates onto the places of power in the judiciary and in the army. But he tried to fix Venezuelan economy, as he appointed a conservative as the finance minister to compromise with his opponents, as well as visited the New York stock exchange to encourage foreign investment, but this was only a facade that was to conceal the actual ambitions of Chavez. These ambitions made themselves clear during Chavez’s second term, where his moderate stance towards the stabilization of the economy was proven to be just a ploy. Chavez started nationalizing companies, which he called corrupt due to their relationship with the previous government, albeit he did this with having no proof of these companies using their wealth to influence national politics. Furthermore, Chavez’s friendly relationship with the leader of Cuba and a communist, Fidel Castro, was revealed, which prompted many to begin to oppose Chavez. Chavez’s opponents used this to accuse Chavez of trying to change Venezuela into a Totalitarian state. This sparked a series of protests and referendums to oust Maduro but none of these events were given recognition by the international community, as Venezuela’s oil was one of the cheapest on the market. After the previously mentioned popular outburst, Chavez relied entirely on the vote of the lower class, and he still obtained majority of the vote during elections. What followed was a period of stabilization for Venezuela, though he made one substantial mistake, he made the entire Venezuelan economy dependent on oil, as many investors were scared to invest in anything other than oil due to Chavez previous attacks private companies. He also amplified many state companies, which decreased Venezuela’s unemployment by over 30%, though this would prove fastly unreliable. President Chavez died in 2013, and was succeeded by his Vice-President and right-hand man, Nicolas Maduro, the current President of Venezuela. Maduro was a high school dropout, and had no experience in holding public office. In 2014, the oil prices around the world dropped, and Venezuela felt the effect of this the most, Chavez’s policy of making the entire economy of the nation dependent on oil, failed, as now unemployment became rampant again as the state companies could not sustain their employees. nationalization of private companies, which provided a very short term solution, as now Maduro could not even raise taxes, as there was no one to pay them, hence he chose to initiate the last resort of any struggling economy, printing money, due to which Venezuela’s inflation skyrocketed. Furthermore, he did not accept any compromises that the opposition proposed, proclaiming them as enemies of the revolution and beginning a campaign of political repression against them for criticizing his policies. Things aren’t looking any better for Venezuela as of 2019, it completely estranged itself from the world in s not-so-splendid isolation, while millions are escaping the poverty and political suppression brought about by Chavez and Maduro. The reason for Venezuela’s tragedy, just like the tragedy of many nations in the last century, is that desperate men do desperate things, in Venezuela’s case, this desperate thing was the election of Hugo Chavez, a Marxist military officer who has attempted a coup against a democratically elected government. Very little people would believe the claims of someone which such personal history, but just like 80 years ago, when many Germans trusted Hitler in the light of the poverty of the Great Depression, the lower classes of Venezuela trusted Chavez. And just like in Germany, the radical opinions of those in power, drove the nation into unprecedented tragedy and calamity. The lesson that we may take away from Venezuela’s tragedy, is that we should not let a small group of men guide the courses of nations, and Venezuela is a perfect example of what happens in such a situation, as even the largest oil reserves in the world were not able to save it from its downfall.